The Elizabethan golden age was peopled by a court of flamboyant and devoted men - each one unique, ambitious and talented. At its centre was a woman, Elizabeth, the Tudor princess who succeeded to the throne of England in 1558 and who vowed to her Parliament to remain unwed and a Virgin Queen for the rest of her life. How did such a diverse group of red-blooded men view their ‘Gloriana?’ What were their aims and intentions? What were their dreams? And just how did Elizabeth manage to control and manipulate them? 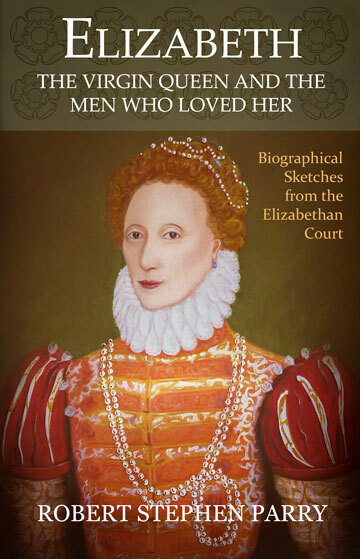 A unique blend of fact and fiction brings the Elizabethan court and its inhabitants to life in an evocative collection of biographical sketches that will inform and entertain in equal measure. ● A fictional memoir blending fact and fantasy. ● A country house setting is the backdrop for a conference and a series of short lectures on the life and relationships of Queen Elizabeth I of England. ● A book featuring biographical sketches of the principal men in Elizabeth’s life, including Henry VIII, Thomas Seymour, Robert Dudley, John Dee, William Cecil, Walter Raleigh, Robert Devereux, Earl of Essex and others. ● Brief, fictional ‘vignettes’ accompany the biographical chapters, in which the relationship or romance with each man is explored through an imagined scene or conflict. 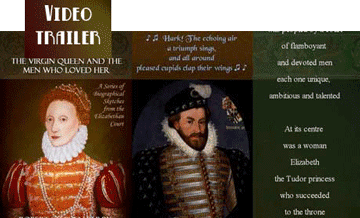 ● Also includes brief chapters on sixteenth-century Elizabethan court life and Elizabeth’s professed virginity. For a special set of webpages featuring portraits of each of the men, click here.